Vitrified Bond CBN Wheels : for internal grinding | Asahi Diamond Industrial Co., Ltd.
Vitrified bond CBN wheels are also used for internal grinding of various auto parts, including transmission gears, injection nozzles, cross joint caps, connecting rods, CVJ outer races and raceways and spherical surfaces. 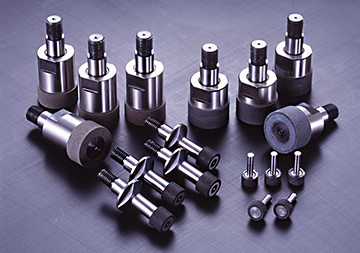 They are also used for internal grinding of bearing inner races, compressor and pump parts. The wheels can be applied to a wide variety of materials, including cemented steel, carbon steel, bearing steel, sintered alloy, etc.